With the NHL season now two months in, I’m sure everyone is as happy as I am that hockey is back in full swing. 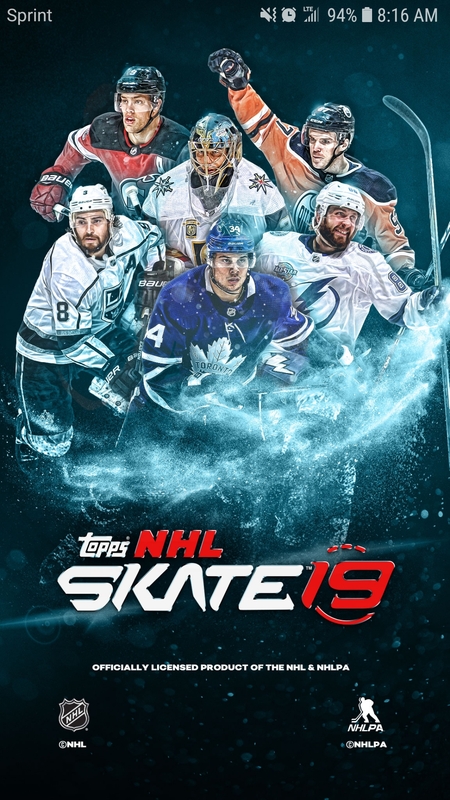 Just like with the last few seasons, Topps Skate is back as well with another year of digital card collecting, trading, and competition. 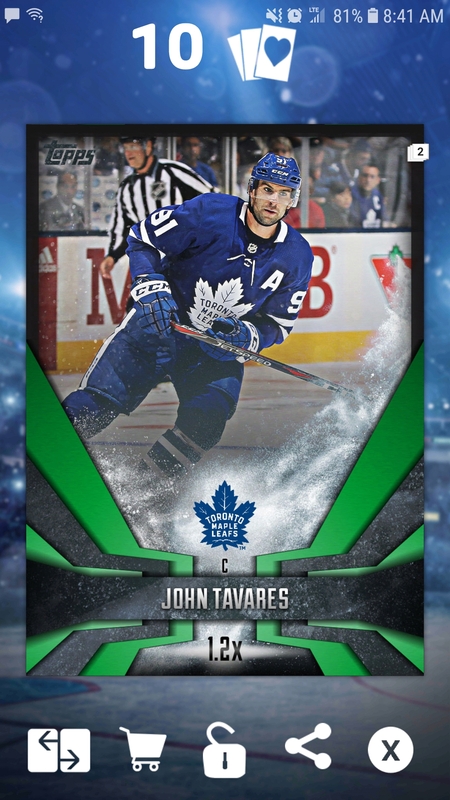 For those not familiar with Topps Skate, it is a digital app for mobile devices, licensed by the NHL and NHLPA, that allows users to collect and trade cards as well as compete in chase contests and live, real-time competition. What’s that you say? 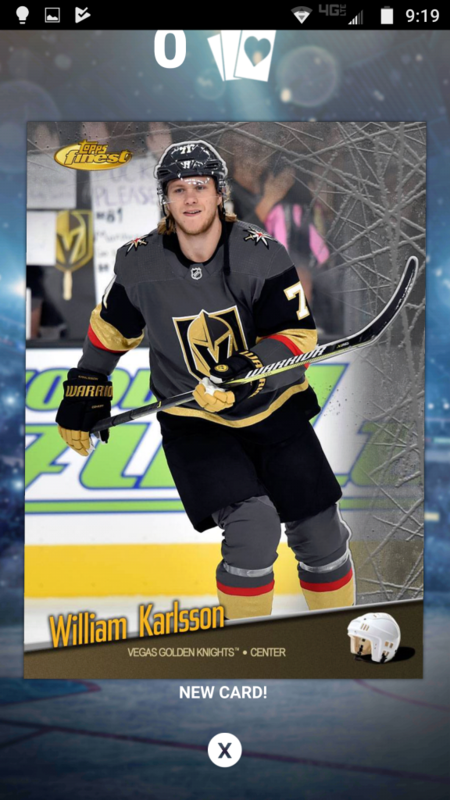 Topps doesn’t make hockey cards? 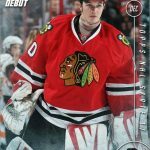 Topps hasn’t made hockey cards since 2004? Well, you would be correct…if we were talking about actual, tangible cards you can touch, smell, and throw in your bike spokes. But in this case, we are talking about digital cards that exist virtually, in the mobile device world, floating through the air as little ones and zeros. 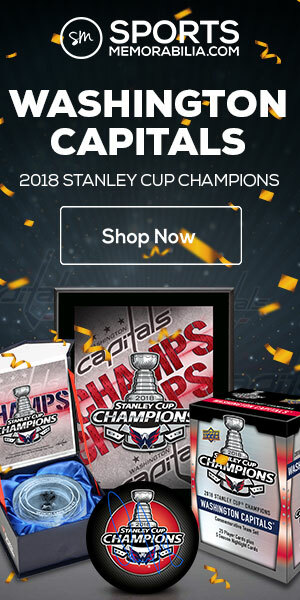 Topps has had a license to produce the app and make card designs since 2016. I don’t recommend throwing your phone into your bike spokes. This year’s app is quite different from last year and received a heavy design face lift. For those familiar with other Topps digital apps, it now looks a lot like the Topps baseball app, Bunt. 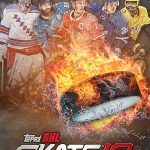 But since we focus mostly on hockey, I wanted to take some time to give our readers a basic overview of the app and also give my take on Skate as a whole. 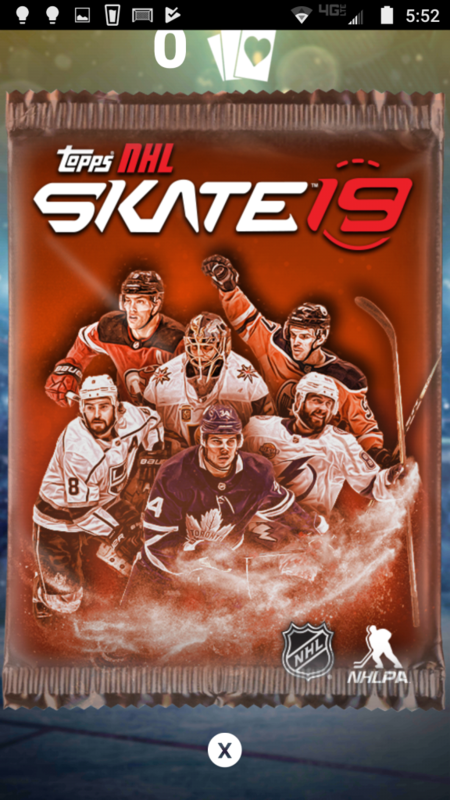 When you first log in, you are greeted with the initial splash screen with the Skate 19 logo and a collage of players including Drew Doughty, Connor McDavid, and Taylor Hall. 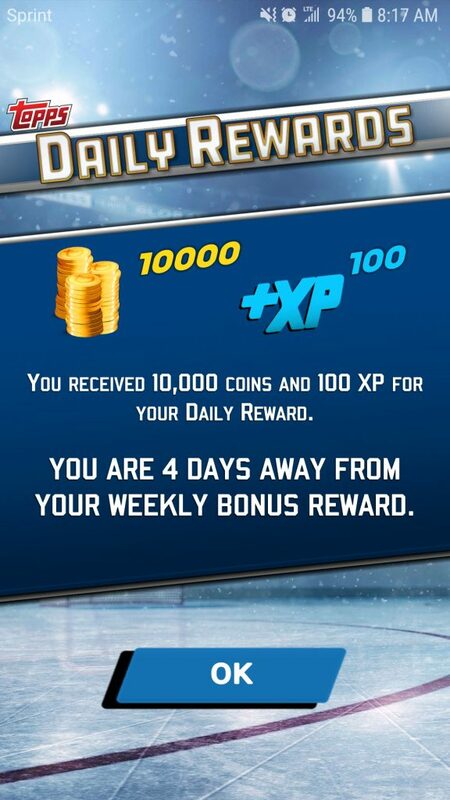 You are given a daily bonus of coins and experience points (XP) if you log in once per day, and a larger bonus if you log into the app for seven days straight. Next, the screen shows the Topps logo and a loading progress bar before landing on the default home screen. There are four main function screens to the app which can be accessed by swiping left or right (no, not what you are thinking). The Collection Screen features most of the control functions you will use on the app. Your username and trader rating appears across the top, as well as the progress bar to your collector level. As you open packs (that you purchase), compete in events, or competitions, and complete collections, you receive experience points that advance your level. 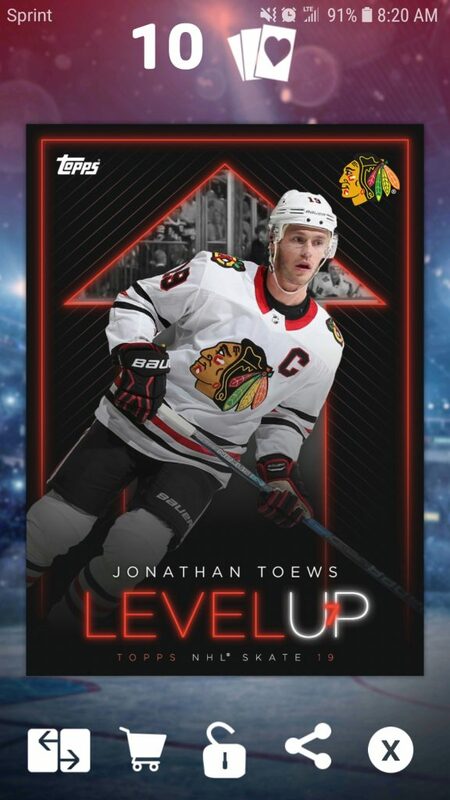 Every time you “level up,” you are given a bonus card commemorating your accomplishment. You can also find your currency counts, showing you how many diamonds and coins you have (more on those later). Your friend list is located next to your username as well this year instead of at the bottom, which makes it easy to start trades with your friends. 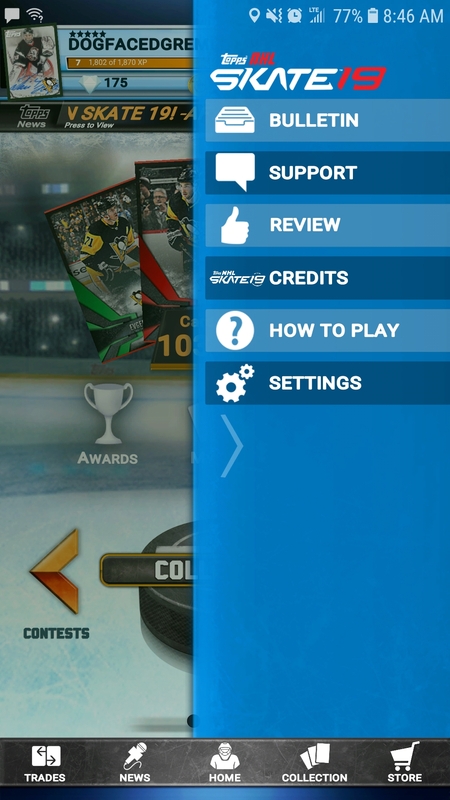 The top of the screen is also where you can access the control panel which features buttons that include: Bulletin – which shows your progress rewards and any app issues, Support – where you can contact Topps directly with issues, the ability to Review the app, Credits – of those involved with the creation and design of the app, a tutorial of How To Play (which I highly recommend if you are new to the app, as I am not going to go into those details here), and the app Settings, where you can shut off all the fancy animations that seem to drag the app speed down (in my opinion and experience, and you may want to do). A new feature this year is the news feed under your user name. News from the app scrolls across the screen, letting you know about other new features or card releases. Another new feature this year is the ability to showcase your “favorite” cards by marking them in your collection with a heart. They will then show up on your main login Collection Screen page and rotate at random. The vital information about your collection is featured in the center below your favorite cards. The screen shows how many cards are in your collection, how many cards you have marked as favorite, and your collection score (which is based on the amount, type, and rarity of cards in your collection). This is also the page where you can access your card awards (the cup icon), your card collection (the cards icon), and your progress toward completing collections (the progress circle with the number in the center). The Contest Screen this year is it’s own main page that can be accessed by either swiping left or right. It features a description of the contest that are available, when they begin, how many participants and what the cost is. As in previous years, not all contests will be free. 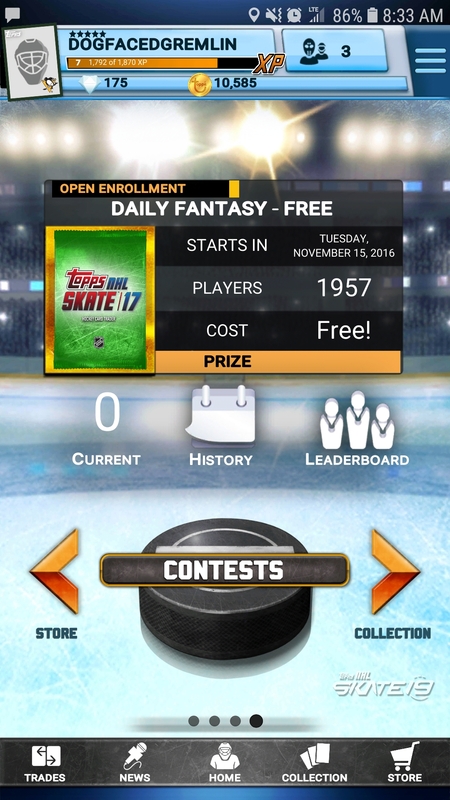 Usually there are a couple free to play “Hockey Night” games, as well as a few that cost a certain amount of coins, have higher stakes, and better awards. These will most likely be rolled out as the season progresses. Under the featured contest description, it shows the current number of contests you are involved in, your contest history, and the overall leaderboard. One of the best parts about the Topps Digital Apps is that you can trade cards with other collectors. It makes it very easy to swap cards with each collector when everything is at the touch of a button. The Trade Screen gives you some options directly on the main page this year, such as initiating a trade or looking through the chat feed for the deals other traders are offering. From someone who has been using these apps for a few years take some advice…other than to initiate trades, stay out of the “troll” fights in the chat room. Some people take digital cards way too seriously because, as I’ll talk about in a second, you can end up spending a lot of money on this game. Regardless, heed this advice; you’ll thank me for it later. You can see what trades you have pending here as well and rate the ones that you have completed. As you complete trades and receive ratings, your trader score will increase (assuming you get high ratings). You will notice that each collector has a score showing how many trades they have completed and a star rating by their username. On this page, there is also an information panel that shows what trades are currently pending for your account, which has received a visual upgrade in the way it’s displayed this year. Some quick advice on trading. The standard trades will generally consist of a color for color trade. For instance, if you find someone with 2 white, 3 blue, and a gold that you need, make sure you offer at least the same in return. I would say that 75% of my trades get accepted when this is done. You will encounter the Game Play traders that look for points comparisons. 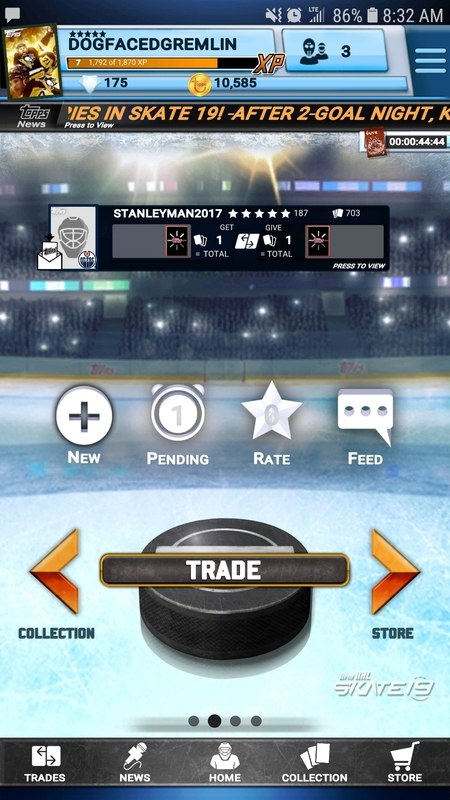 Keep that in mind at all times as you will encounter situations where if you try to trade a gold James Van Riemsdyk for a blue Kris Letang, you will probably get shot down. Traditionally, defensemen score a lot on this game because of their ice time and number of shifts. You will also encounter the “hits” collector. These are the folks that could care less about base cards and only look for inserts and rare cards. Trades with them can take a little more time and finesse. But overall, don’t be afraid to make trades. The worst someone can say is no. The Store Screen has been ramped up a bit in this years app and now shows which new card packs are being featured and when they expire. 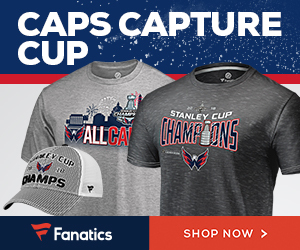 You can also access the store directly from either the shopping cart icon in the center of the page or from the static bar at the bottom of your screen. The store itself allows you to buy packs of cards using either your coins or diamonds. 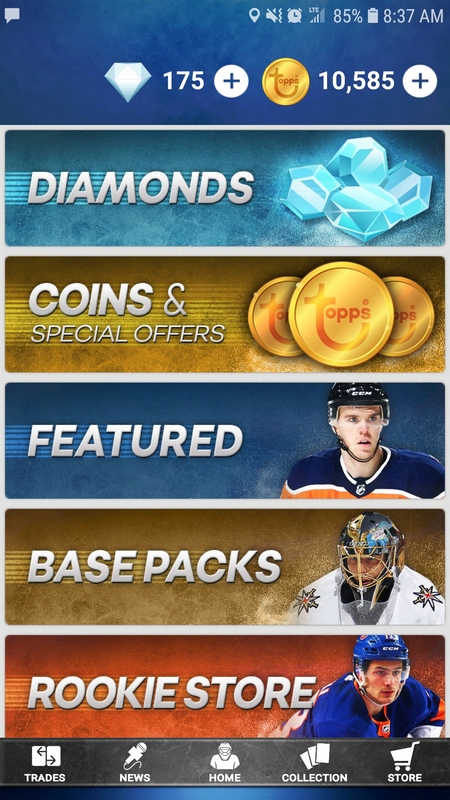 For those new to the app, coins and diamonds are the currency used to make purchases within the app. Both forms of digital currency can be purchased for, yep, you guessed it…REAL MONEY! 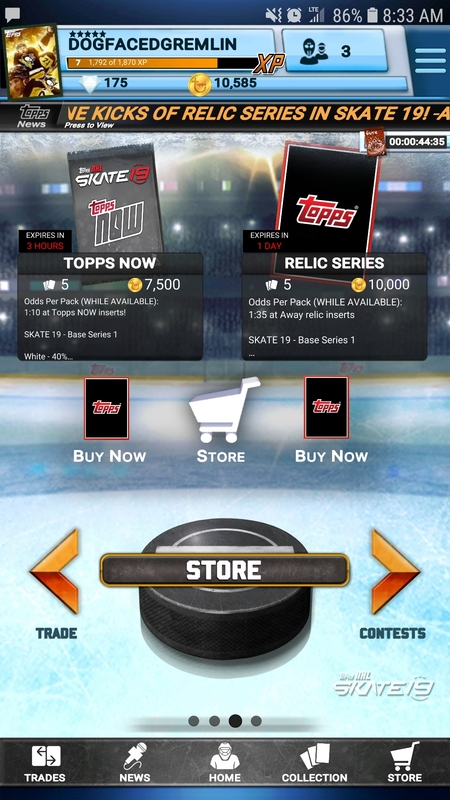 Coins are the basic form of currency in the game store. Most general packs can be purchased for anywhere from 7,500 coins up to 30,000-40,000 depending on what is in the packs (I haven’t seen any 5,000 coin packs yet, though there were quite a few available in past years). More basic entry-level packs can be obtained for less but contain fewer cards. Coin packs can be obtained for anywhere from $2.99 for 25,000 up to $19,99 for 200,000. Of course, like most online games with in-app purchases, there is a TapJoy function where you can get free coins for completing tasks, downloading other apps, or watching videos. You can also obtain higher quantities for exchange of diamonds too. Where coins are the basic form of currency, diamonds are the “high roller” money in the game and can get you the more premium cards available much quicker. Diamond packs are only obtainable with real money and they range from $2.99 for 500 diamonds up to $99.99 for 22,000 diamonds (which for an exchange purpose, 22,000 diamonds equals about 1,125,000 coins). Many of the more premium packs that cost 10,000 or more in coins with 1:10 and up odds at the inserts can also be purchased for diamonds with guaranteed hits. The packs you can purchase contain at least five cards (for the most part) and will contain an assortment of “common” cards which will range in rarity based on color, as well as a shot at whatever themed insert the pack features. Most inserts will range from 1:5 packs up to 1:several hundred, depending on the rarity of the insert. There will be chances throughout the year to chase limited inserts, digital signature cards, digital relic cards, alumni, and other limited edition release cards. This years card design is, well, interesting to say the least. When I first opened the new app and received my complimentary packs, I was kind of taken aback at how much these resembled something from the likes of a Panini Sticker Album. 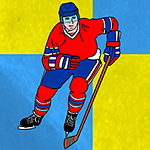 They are very busy in design, with the vast majority of space on the bottom being taken up by the tier color pattern, team logo, player name, and multiplier information. 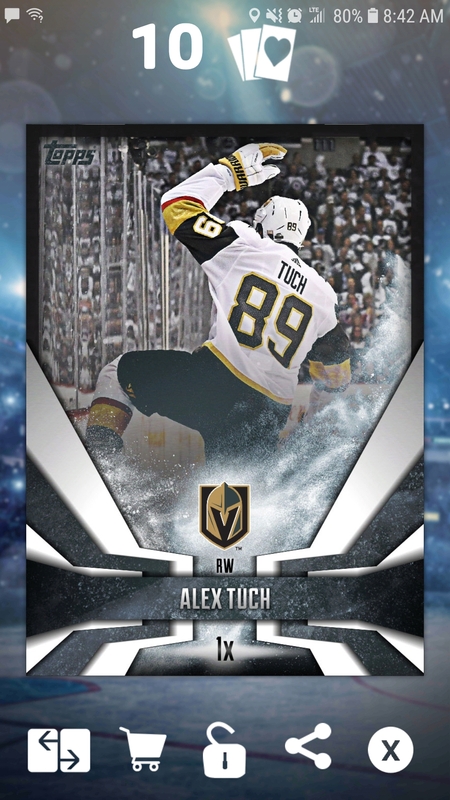 The rest of the card features an action shot of the subject player. I wasn’t a big fan at first, but now it’s growing on me. The card backs are very plain and would probably be kind of off-putting to someone expecting a more traditional card design. But those that are familiar with online sports gaming applications that use real-time statistics, will surely understand why. 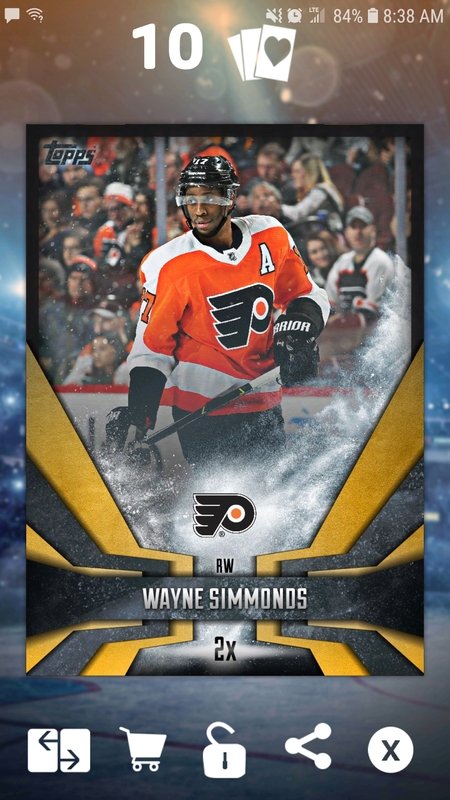 The card features the player name, team logo, position and multiplier at the top. The better the card (more rare), the higher the multiplier. Below the name, it shows the last game that the player had, the overall game score, and the number of points the player scored. There is a scrolling score ticker that also displays the stats that each player received points for. Next is the “stat calendar” as I call it. You can scroll left and right to see how the player performed in previous games. Below that area displays the average game points the subject player scores, as well as their overall season points and ranking, and a “Heat Index” that I’m guessing ranks the player on the premise of how well they have been playing. Finally at the bottom of the card, it shows the series the card comes from, the rarity of the card, the card count (if it has one), and the card number (as it stands in the total card release in the Topps digital universe). There are multiple tiers of cards in the game, as I had mentioned previously. The basic card set features white, green, red, blue, and gold. The rarer colors give multiplier bonuses in the Daily and Weekly Contests. For example, a White card may earn you 100 points if the pictured player scores a goal. 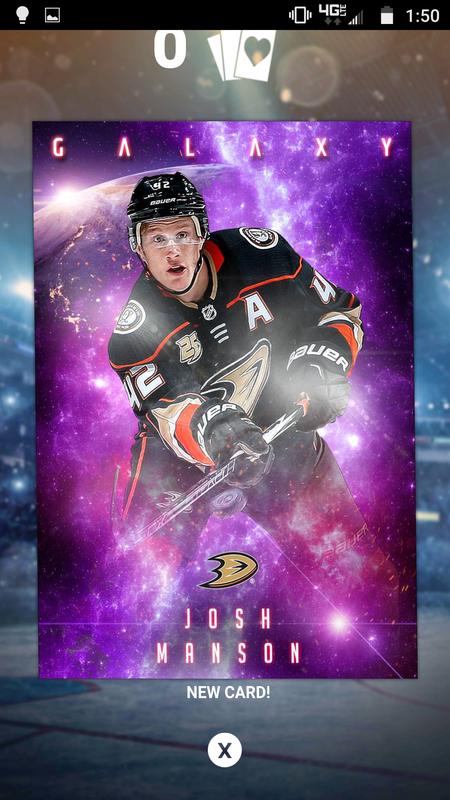 But if it is the Gold version of the same card, it will get you 200 points if the pictured player gets a goal. The gold cards are the rarest of the bunch and card counts can be found on the back as mentioned above. At this time, many of these are less than 600, but as the season moves on, that will surely increase. 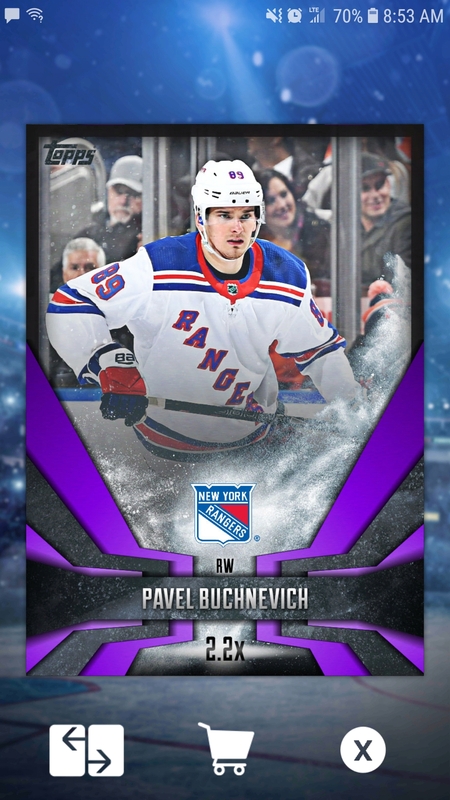 You may notice purple cards as well which are extremely limited and I believe have only been obtained through purchasing certain packs that contain the rare color variation. These, so far, are numbered mostly below 50. My favorite part of the app is the daily contest. This is where you can put your digital collection to work and earn points and possible prizes. Each day, you can log into the app and put a virtual lineup of player cards from your collection into action, competing against other collectors all over the Topps Universe. Player card scoring will directly correlate to their performance in their real game. It’s like fantasy hockey with the ability to change your player line up mid-game. Most days, there is an unlimited play contest and a limited play contest. The unlimited is just as it sounds, unlimited. You can make as many changes as you want throughout the night. For the limited contests, there are usually play limitations, mostly set at three moves per night. I usually just stick to the unlimited play and swap guys in and out as I see fit. If you can muster up enough points to finish in the top rankings, your prize will be doled out at the end of the evening and can range from XP (Experience Points) to cards, to tickets (more on that in a second). 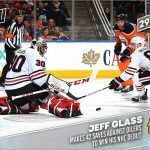 There is also usually a Weekly Contest that is based on cumulative points scored during all the weekly NHL games. This one is a little more tedious, but usually results in a big payoff of limited or low-count cards. I mentioned Tickets above when talking about awards. 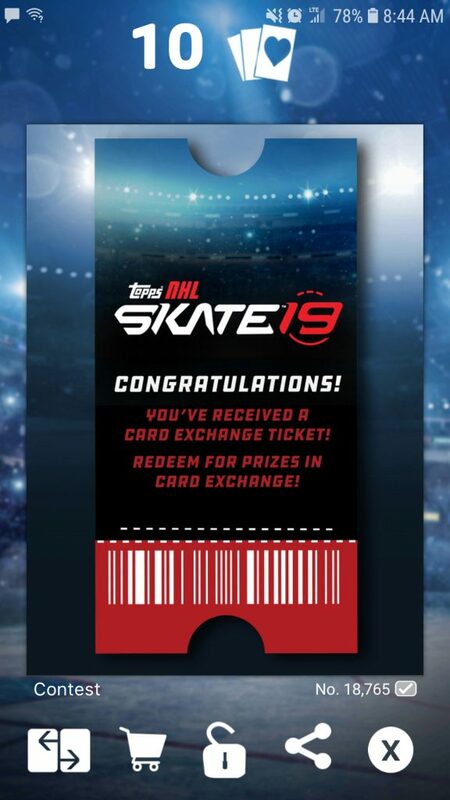 A new feature in this years Skate, as in previous years of Topps Bunt, is a ticket exchange program. In Bunt, this has been used to upgrade cards; in Skate, the purpose of the tickets (thus far) is to purchase insert cards in the Card Exchange engine under the Collection feature. Where the Card Exchange feature had been used to “meld” a number of colored variation cards into the next color tier above, this year is used to make purchases. Since the onset of the game, there have been three or four opportunities to purchase some inserts, ranging from a cost of one ticket to two tickets. 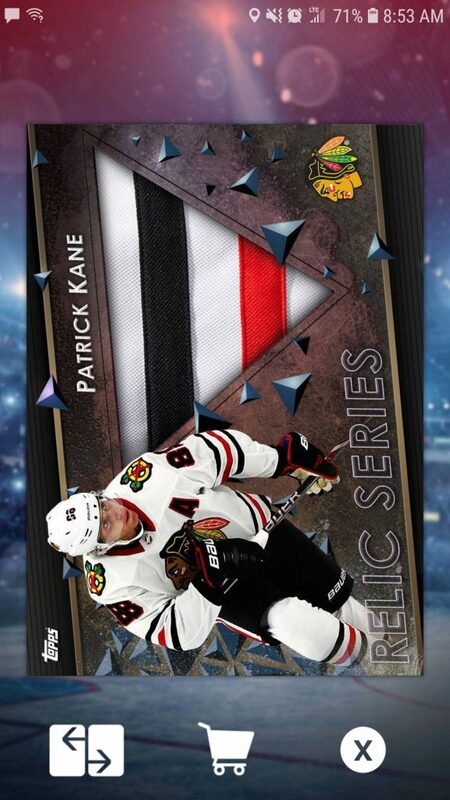 So far, these have been inserts that were also available in pack purchases for the stated odds of each pack. 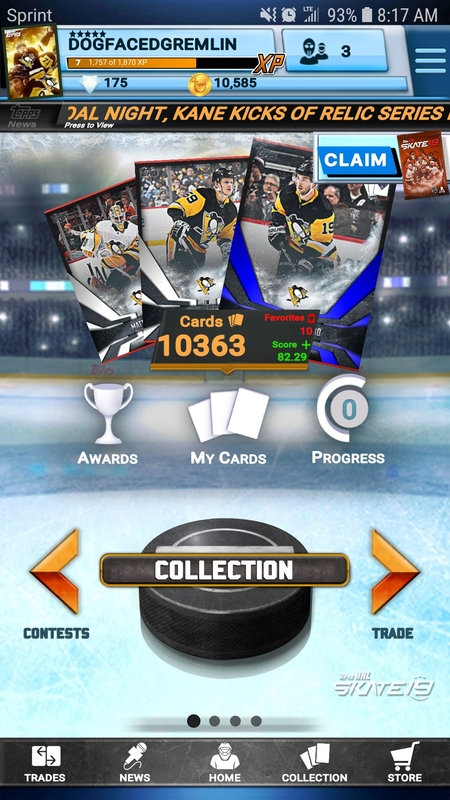 If you are good at the contests, you can bypass the luck of the draw virtually ripping packs, and just buy the cards outright. Again, I’m not going to go over how to play the game overall. I will defer back to the How to Play portion within the app settings. 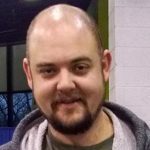 It is a very good read for newcomers to the game and should be reviewed. It is also a good idea to check the News feature and read about the various releases and game changes since the initial release of the app. This will give a better idea of what the game is all about. Design: 3.5/5. I would have gone to an 4 but since I have downloaded the game, I have run into some issues with design flaws that have yet to be corrected. The ability to turn off animation has helped but I think the reliance on a graphic heavy engine sometimes bogs down the game. When I am actively playing the nightly games, sometimes the app locks up. There is also a problem with using the back button on your phone versus the back button in the game on some screens. While these are all minor things that affected my rating, I think the card design could have been tamed a bit and made more appealing (see the Fan’s Choice Inserts in the game). Game Play: 5/5. 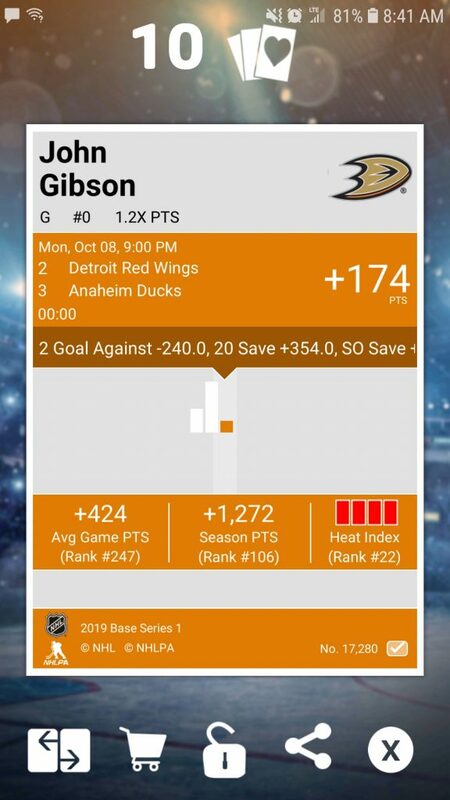 There really aren’t many games for phones or mobile devices where you can get that real-time fantasy feel without actually being in a Fantasy Hockey league. I love the ability to compete and the challenge of being able to field a team capable of toppling players from all over the world is great. Ease of Use: 3/5. The first few years of the app was very straightforward and simple. This year is a bit difficult to navigate for a new player. Don’t get me wrong here. It looks great but sometimes the bells and whistles can be too much and I think this is what is going on here. I would have put more features on the main nav screens and left the control panels out. Interaction: 4/5. The trade function is fantastic. 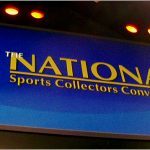 The chat room is a great opportunity to connect with other collectors and get the news out that you are trading and what you are looking for. The game play allows you to interact with other players, post in the game feeds and even trade with opponents. There are two issues I have here that forced me to give it a 4 rather than the big 5. First is the fact that the chat features don’t seem to be monitored and they can become a cesspool of ridiculousness. The second thing, the customer support via email and within the chat, again, don’t seem to be monitored. If you have issues, Topps isn’t very quick in responding (if at all). However…and this is a big HOWEVER…Topps has been great if you contact them directly on Twitter (although some people still don’t use Twitter). Tim Parish is a writer-at-large for Puck Junk. Follow him on Twitter @therealdfg. Unfortunately, no. Since Topps only has a digital license, hard copies can’t be printed (unlike Upper Deck ePack). Some of the relics and signatures would be great as tangible cards. Thanks on the username compliment. I’ve used that in apps, emails, and logins since about 1995. Rick was my favorite!